ORLANDO – Over 1,000 residents from throughout Florida met last Saturday to demonstrate widespread outrage at the lack of quality, affordable health care. The assembled crowd filled a gymnasium adjacent to the O-Rena (officially the Amway Arena, named after the pyramid billionaire tea bagger Rich DeVos). Oceans of AFSCME (American Federation of State, County, and Municipal Employees) green, SEIU (Service Employee International Union) purple, UNITE HERE and ACORN red blended in with the colors, symbols, and insignia of a wide variety of community and labor organizations. Unlike the protests against health care reform, the community center was black, brown, white and all the shades in between. The atmosphere stood in stark contrast to the typically small and somber political demonstrations which are customary in Orlando. It was particularly fitting that the event was held in a basketball stadium emblazoned with the logo of the Orlando Magic. Throughout the stands, and spilling out onto the court, were people dancing, swaying, chanting, and singing along to such empowering tunes as “Ain’t No Stopping Us Now”. Within the stadium there was an overwhelming sense of power and joy. It was as if every mind and spirit in attendance was imbued with the sense of impending victory. Organizers had the foresight to require participants to reserve tickets. While it is unfortunate that such measures had to be taken, in light of the increasingly juvenile, vitriolic, and generally obscene overtures made by the opponents to health care reform, it was a quite reasonable decision. Where were the teabaggers? A five person contingent came ready to do battle against “Oligarch Overlord Obama and his state appointed elderly executioner squad.” Once inside, one started to cause a scene, and was quickly singled out by volunteer security guards who alerted the organizers and the teabagger was hastily ejected by the Orlando police department. At 2:20 in the afternoon the event began with a moment of silence for the recently deceased “liberal lion” of the Senate, Edward “Ted” Kennedy. It was obvious that the death of this influential and progressive Senator has had a great impact on a large segment of the working class, particularly those who are fighting for health care reform. Mr. Matt LeClair spoke to the crowd about his harrowing experience with the current broken American health care system, “When I was twenty I thought I hurt my back. When I was twenty-two I had enough money to realize that I hurt my back. The MRI cost over $3,000. When I was twenty-three I learned I had a herniated disk. When my boss found out about my screwed up back he fired me and put me out on the street. This is why we need health care reform now”. These stories can be viewed on-line at http://www.healthcareforamericanow.org/site/your_stories/. Mr. Randolph returned to the microphone to speak to the demonstrators about a disturbing development in the state government. It appears that Republican majority is trying to pass a bill nullifying any health care bill that the federal government passes. Just as they are planning to do with the Employee Free Choice Act, it appears that state Republicans are preparing to take actions which have been considered illegitimate within the union since the civil war! The event wound down with a short original song performed by Orlando’s own Tiffany Jones, a staunch organizer for the local chapter of the Association of Community Organizations for Reform Now. After the last beautifully sung note, the organizers announced to the crowd two important dates. They were urged to spontaneously visit representatives’ offices on September 2nd, to urge the staff to pass on the message that Florida is demanding action in support of health care reform, and were urged to call back one week later to drive this point home. 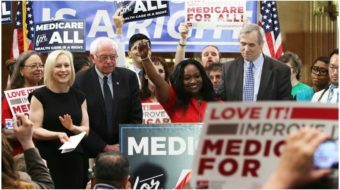 The organizers are planning on swarming national representatives with 9,000 calls on September 9th in support of health care reform. Special emphasis was put on targeting sometimes Democratic Senator Bill Nelson, who has not provided a substantive support for a public option.